Undertaken in Pursuit of Natural Knowledge, at the Desire of the Royal Society: containing All the various Occurrences of the Voyage, with Descriptions of several new discovered Countries in the Southern Hemisphere; and Accounts of their Soil and Productions; and of many Singularities in the Structure, Apparel, Customs, Manners, Policy, Manufactures, &c. of their Inhabitants. 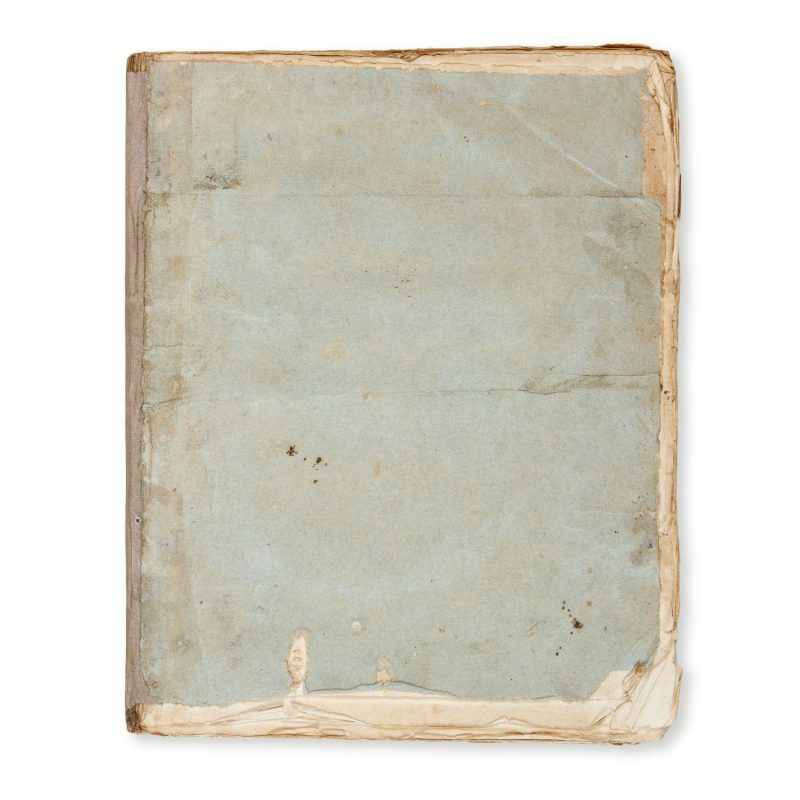 To which is added, A Concise Vocabulary of the Language of Otahitee. London : T. Becket and P.A. de Hondt, 1771. Quarto, in the original plain blue-grey wrappers (spine renewed in plain paper); with the suppressed Dedication leaf; wide-margined (297 x 235 mm), entirely uncut, a superb, unsophisticated copy; pp [ii], ii, 130, [iii]; previously in the collection of Melbourne bibliophile Bernard Gore Brett, his bookplate on the wrapper verso; a small abrasion to the upper wrapper, extending to the title page; housed in a quarter calf slipcase. 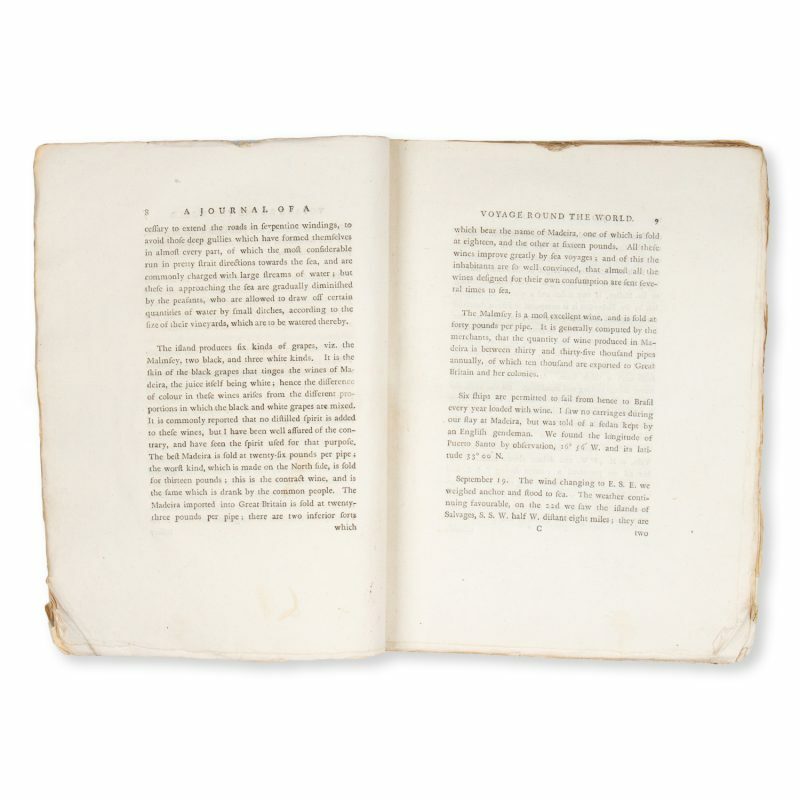 FIRST EDITION, FIRST ISSUE: THE CORNERSTONE OF ANY COOK COLLECTION. 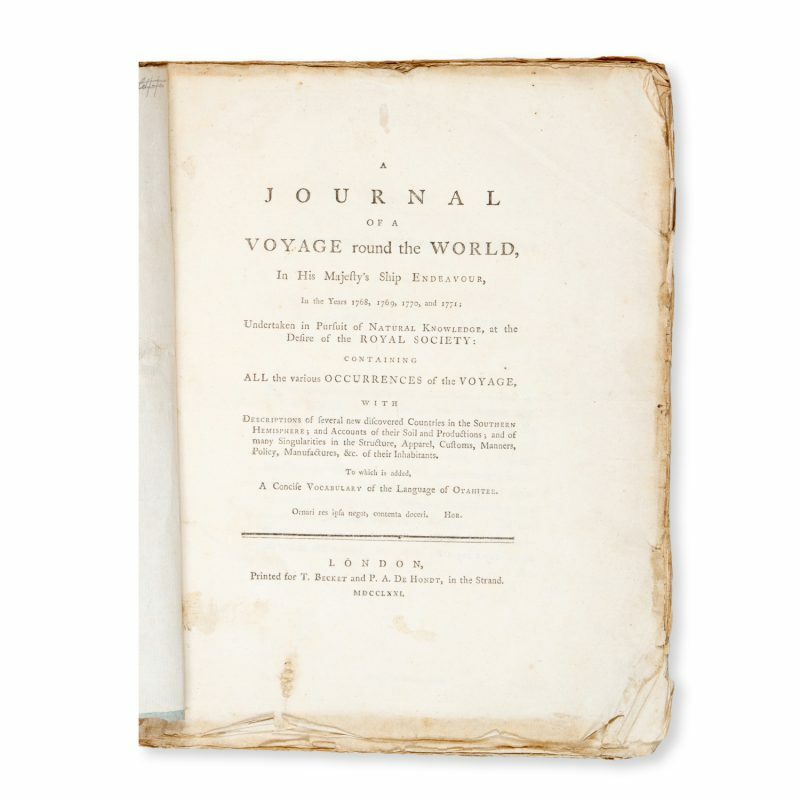 This is the rare first issue – with the suppressed dedication leaf – of the first account of Cook’s first voyage and of the discovery of New South Wales, published within three months of the Endeavour‘s return in 1771. It is of immense significance, as it contains the first printed account of the east coast of Australia. Its appearance predates the naming of Botany Bay, which is referred to as Sting-ray Bay, the name originally given to it by Cook. 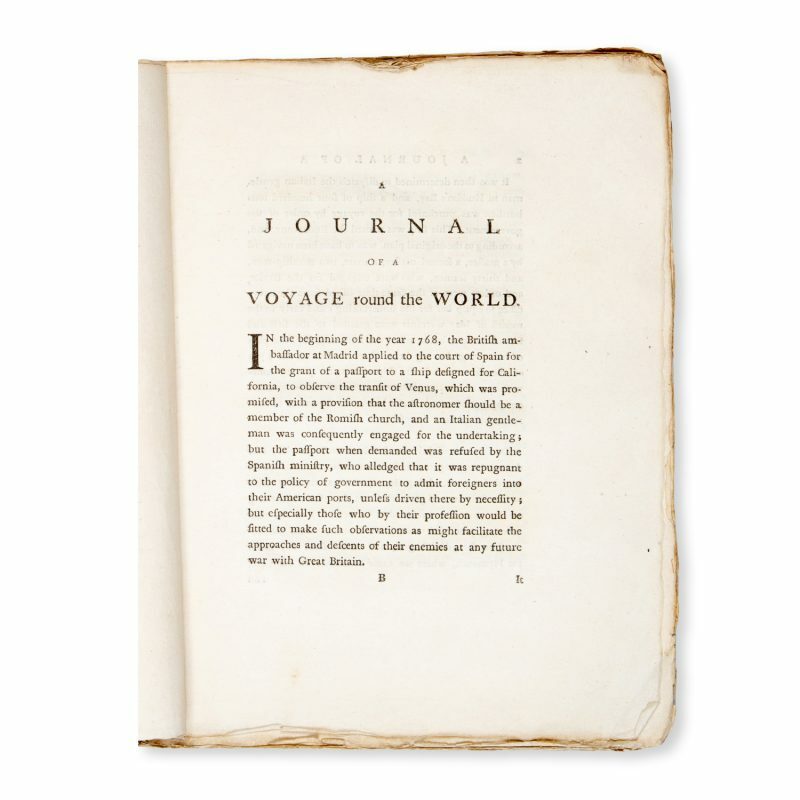 Anonymous and unauthorized, the publication preceded Hawkesworth’s official account of the voyage by some two years. 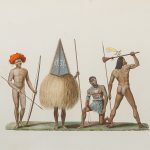 It was the first of numerous so-called ‘surreptitious’ accounts of Cook’s voyages. 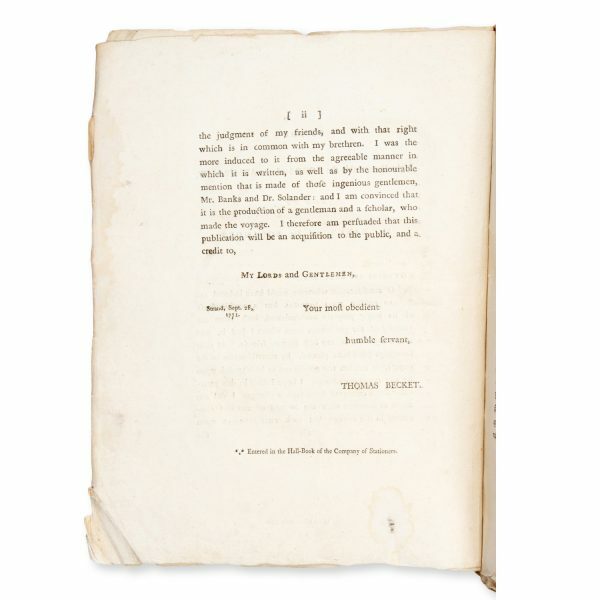 The dedication leaf, which was not included in the second issue, was printed separately from the text. 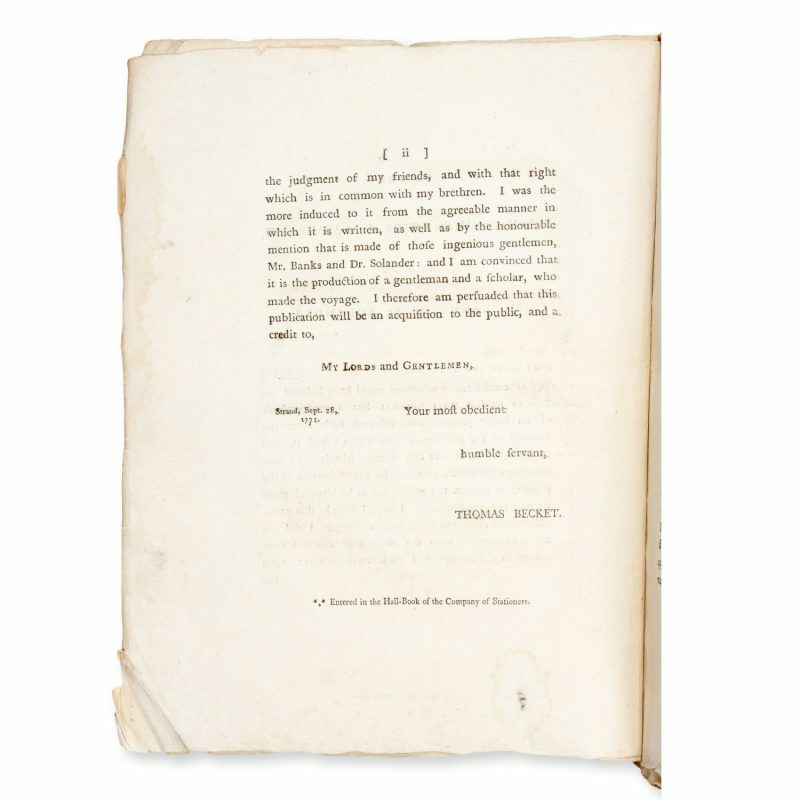 Inserted by the publishers, Beckett and de Hondt, to give the publication an air of credibility and the false status of an authorized work, the dedication is to: ‘The Right Honourable Lords of the Admiralty, and to Mr. Banks and Dr. Solander’, with an instruction to the binder to ‘Place this next the title’. 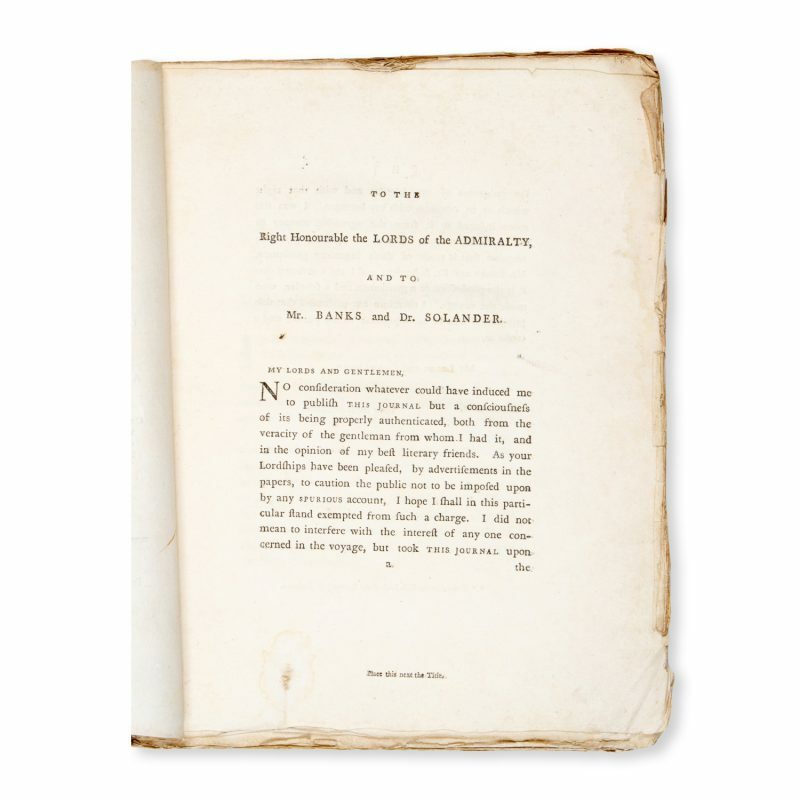 The leaf was promptly removed following the threat of legal action by Banks and Solander, and as a result very few copies which retain the suppressed leaf have survived. 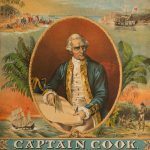 The legitimacy of the narrative as a first-hand account has, in spite of its anonymity, never been challenged: its authorship has always been attributed to a member of Cook’s expedition. 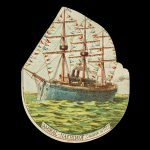 However, Admiralty regulations decreed that all crew on the Endeavour surrender their journals at the end of the voyage, and forbade the publication of any voyage account until after publication of the official account – hence the need for the author’s identity to remain concealed. Beaglehole suggested that the American Loyalist, midshipman James Maria Magra (later Matra), was the probable author; this has since been convincingly corroborated by Frost in his analysis of the entire corpus of Magra’s writing (see Frost, Alan. The Precarious Life of James Mario Matra: Voyager with Cook, American Loyalist, Servant of Empire. Melbourne, 1995). 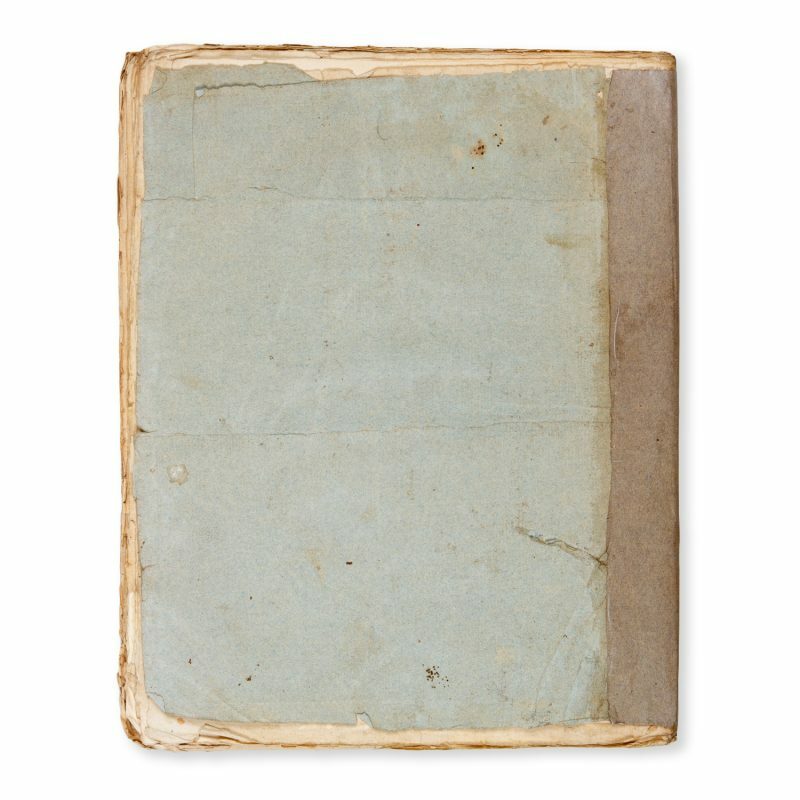 If this identification is, as is now generally accepted, correct, then Magra’s deviousness in flouting the rules by not declaring the existence of his journal and his illicit release of it to the publishers for financial gain would surely have confirmed for Cook his own assessment of Magra as ‘good for nothing’. 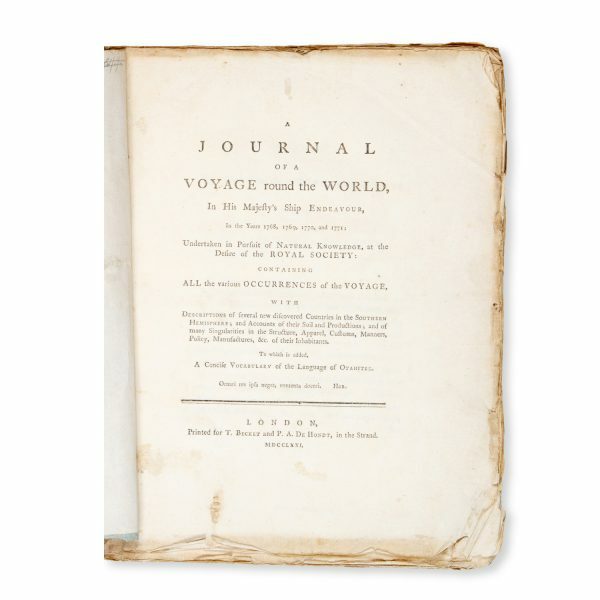 An exceedingly rare and significant work, recording the European discovery of New South Wales. This exceptional, unsophisticated copy – entirely uncut in the original wrappers – is undoubtedly one of the best that are known to have survived, and is quite possibly the most desirable to have been offered on the market. Bagnall 3324; Beaglehole, I, pp. cclvi-cclxiv; Beddie, 693; Davidson, A Book Collector’s Notes, pp. 53-4; Hill 2, 1066 (second issue); Hocken, p. 9; Holmes, 3; Kroepelien, 215; Sabin 16242.